On 12 January 1968, four North Vietnamese Air Force AN-2 Colt biplanes lifted off from an airfield in northeastern North Vietnam and headed west toward Laos. The aircraft were on a mission to destroy a US radar base that was guiding bombers in attacks against targets in North Vietnam. The An-2 is used as a light utility transport, parachute drop aircraft, agricultural work and many other tasks suited to this large slow-flying biplane. Its slow flight and good short field performance make it suited for short, unimproved fields, and some specialized variants have also been built for cold weather and other extreme environments. Known to the Americans as Site 85, the radar facility was perched atop a 5,800-foothigh mountain, Phou Pha Thi. Manned by US Air Force volunteers “sheepdipped” as employees of the Lockheed Aircraft Corporation, the site had been in operation only a few months. The mountain, used for many years as a staging base for CIA-directed Hmong guerilla fighters and American special operations and rescue helicopters, was only 125 nautical miles from Hanoi. Air America, a CIA-proprietary, provided aerial support for the facility, the technicians, and the security forces. On 12 January, CIA spotters reported a four aircraft formation flying in the direction of Lima Site 85. The aircraft spotted were Soviet-made Antonov An-2 biplanes. Two aircraft flew towards Lima Site 85, while the other two split off. The Vietnam People’s Air Force, in one of their few air attacks during the entire conflict, was attempting to destroy the radar at Lima Site 85. As the two An-2s flew over Phou Pha Thi, their crews dropped 120 mm mortar shells through the aircraft’s floor and also strafed their targets with 57 mm rockets from the wing pods. Coincidentally, Air America captain Ted Moore, flying a UH-1D Huey helicopter carrying ammunition to the site, saw the attack (“It looked like World War I,” he recalled.) and gave chase to a Colt as it turned back to the Vietnamese border. Moore positioned his helicopter above the biplane, as crewman Glenn Woods fired an AK-47 rifle down on it. The pursuit continued for more than 20 minutes until the second AN-2 flew underneath the helicopter. Dropping back, Moore and Woods watched as the first AN-2 dropped and crashed into a ridge just west of the North Vietnamese border. Minutes later, the second Colt hit the side of a mountain three miles farther north. The other Colts escaped, inactive observers throughout. Within hours, a CIA-controlled ground team reached the crashed aircraft and found bullet holes in the downed planes. 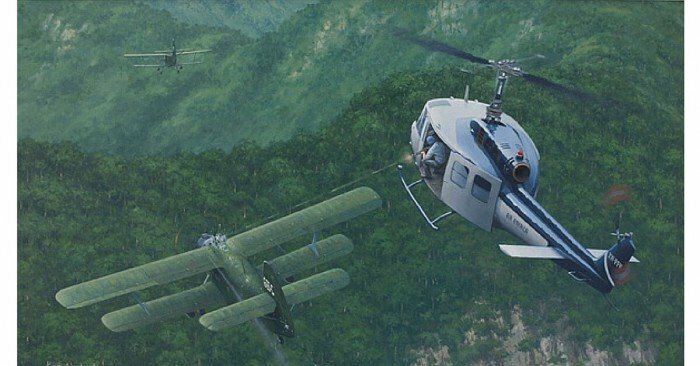 In the mists of the Annamite Mountains and part of a secret war, Air America employees Ted Moore and Glenn Woods gained the distinction of having shot down a fixed-wing aircraft from a helicopter, a singular aerial victory in the Vietnam War. Two months later, North Vietnamese commandos attacked and destroyed Site 85, inflicting the deadliest single ground loss of US Air Force personnel of the Vietnam War. On 27 July 2007, CIA officially received An Air Combat First in an event attended by members of the Air America Board; pilot Ted Moore; Sawang Reed, the wife of flight mechanic Glenn Woods; CIA paramilitary legend Bill Lair; and the donors of the painting, former Air America officers Marius Burke and Boyd D. Mesecher.